In 1791, the English philosopher Jeremy Bentham designed a building where its occupants could be watched by a single invisible observer. 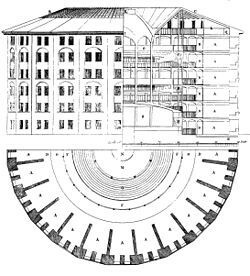 His design, known as the Panopticon, was of a circular building with a central inspection house and space for occupants around the perimeter. While he acknowledged that the design had many potential applications, much of his attention was focused on the ideological benefits of the Panopticon in correctional facilities like prisons. 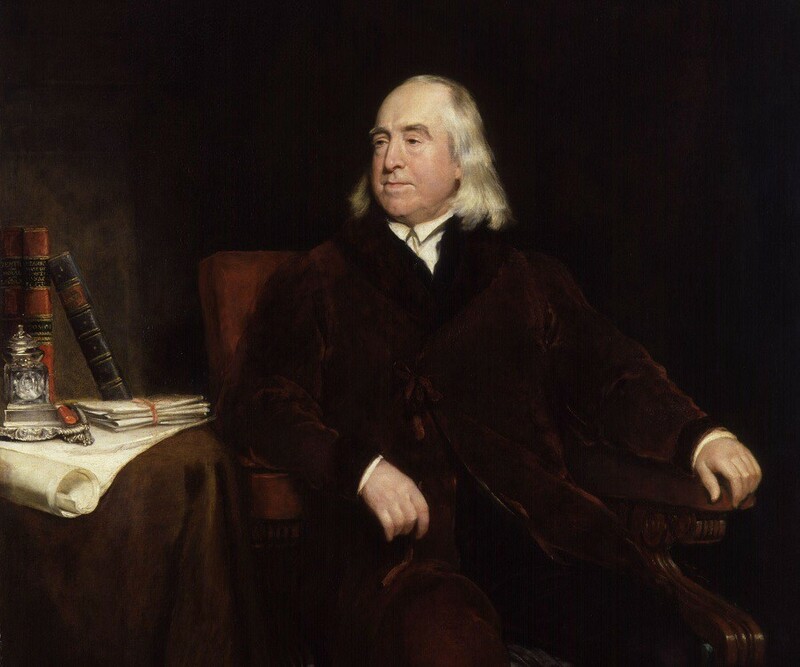 Naturally, these benefits included significant cost savings, but more importantly to Bentham, it was his fascination with the idea that inmates would be compelled to regulate their own behaviour that appealed to him most of all. For, the supposed genius behind this Panopticon design, was that inmates would not be able to see the watchtower and would therefore not be able to tell when they were being watched. …in Portugal, France, Holland, Australia, and the United States. 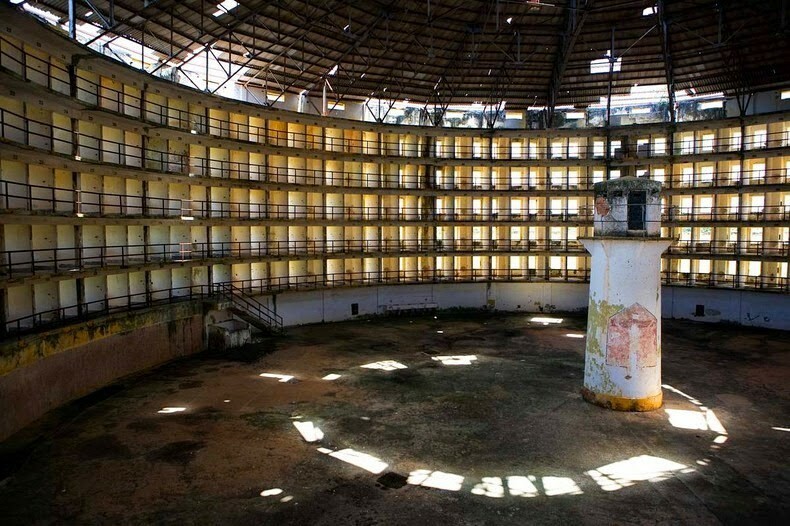 The largest, and perhaps the most famous of all such prisons, was built between 1926 and 1928 on a tropical island found 30 miles off the southern coast of Cuba, called the Presidio Modelo. The five buildings at the Presidio Modelo were designed to accommodate a total of 2,500 inmates in rings of cells five-storeys high. Famous inmates included Fidel Castro and his brother Raul. Today, the Presidio Modelo is nothing more than a tourist attraction. It’s crumbling walls serve as a reminder of the brutality, riots, and hunger strikes that occurred as the number of inmates swelled to over 6,000 and conditions worsened. One journalist, writing in 2015, went so far as to call the island upon which Presidio Model sits, “a boneyard of big ideas”, having also been used as a hideout for pirates, a Spanish penal colony, an American enclave, and the setting for one of Castro’s most ambitious attempts to establish a new communist world order with his allies. …I’m talking about the issue of privacy in the digital age. Through the ages, and throughout our lifetimes, society has seen privacy used and manipulated in various forms, and with various levels of awareness of the risks posed by its removal. If I were to ask you when you first realised the importance of privacy, I’d imagine most of you would immediately think of your email account or banks details. When did you first discover privacy? But what if I were to tell you that privacy has been shaping your life and the lives of your family and friends since birth? The difference today, is the lengths some people will go to try to get information about you, and the level of sophistication required to keep these details safe from prying eyes. Unfortunately, these systems are failing. The security of our private records is being neglected, with little incentive to ensure that the organisations that harvested them, treat them with the level of importance that you need to be able to perform basic social, economic, and political tasks. In recent weeks, Facebook was fined the maximum amount of $650,000 by a UK watchdog for its role in the Cambridge Analytica scandal. Eight minutes later, it had earned enough to pay the fine and continue with business as usual. …all suffered from some form of data breach in 2018. Political leaders tell us that it’s almost impossible to create privacy legislation quickly enough to keep pace with technological innovation. Business leaders also claim that privacy is simply too complex to be solved. It’s not just politicians and CEOs that are interested in our personal information either. A growing number of criminals would like to steal it, replicate it, and use it for their own personal gain. So much so, that Apple CEO, Tim Cook, recently warned that our data is being “weaponised with military efficiency”. Think about that for a second. Our data is being weaponised. You may be thinking what kind of weapons could possibly be made with my data. But the havoc that can be created just by having access to an email account and password, means we are facing a global privacy epidemic on an unprecedented scale. If we don’t act soon, we risk walking into a minefield of issues — one in which allegations of election tampering will be the least of our concerns. So far, we’ve done very little to protect ourselves. Some might go so far as to say that we’ve learned to temper our expectations. Perhaps more worryingly, not only have we stopped caring, we’ve also stopped asking questions about the motives of those who made their fortunes monestising our data… how many of you have stopped to consider whether privacy can be monetised? In an era of big data, this may sound counter intuitive. Some of you may question how you can plan, let alone succeed in today’s world, without data. But let me ask you this. Were businesses successful before our obsession with big data? Does giving your data to someone else make you more likely to spend money? According to research conducted on behalf of IBM in 2018, the opposite is true. By this reckoning, it is also fair to assume that those who do trust companies to protect their data are more likely to buy products. Think about your own experiences as a consumer. When was the last time you or someone you know, left a marketplace or a shop because an overeager store assistant was hovering over your shoulder, or because you felt that someone might be watching your every move? It’s the same online… with the green little lock sitting next to the domain name on your browser…with the exception that our technologies are far more pervasive. At Tangram, we’re working to create a network, protocol, and software that will provide people with the tools they need to be able to take greater control over their own financial security and privacy. …utilising cutting-edge open-source cryptography, computer engineering, and compelling user experiences to create the world’s most private distributed ledger network for a vibrant community that values principles of equality and shared prosperity. We’re also targeting a shift in perceptions towards privacy, from an idea that serves governments, businesses, and even criminals, to one that everyday individuals are entitled too. We appreciate that to be successful in what we hope to achieve, we must rewire ourselves and educate others about the nature of privacy, ensuring that we replace perceptions of secrecy, with emboldening ideas about dignity and respect… so that when we look back 50 years from now, instead of a boneyard of failed ideologies, we will see communities of individuals that are empowered to “selectively reveal oneself to the world” when they choose to, and not because a third party forces them to so they can cash in. To get there, we will need people everywhere to join our defense of the right to privacy, and to work together to create a safer, more just, and more prosperous future for all… and we invite you to join us through partnerships and initiatives that will also enable you to achieve your own personal and organizational goals.